These plump little pasta pillows are filled with a light yet luxurious filling, cooked quickly to order and served in a delicious herb-infused butter. To make the filling, put the ricotta into a bowl with the lemon zest, marjoram, Parmesan and some salt and pepper. Stir well to combine, then taste and adjust as necessary – it should be well seasoned and have a clean, lemony taste. Roll out the pasta dough into a rectangle, about 40 x 20cm. Turn the dough so you have a long side facing you. Spoon little mounds of ricotta filling along the side closest to you at 5cm intervals, leaving a 3cm clear border along the front edge. Once all the ricotta has been positioned on the dough, bring the furthest edge over the filling to join the front edge and enclose the stuffing. Using your thumb and forefinger, press the pasta dough down firmly around the filling to seal. Now, using a sharp knife, cut through the sealed pasta into little square ravioli parcels. 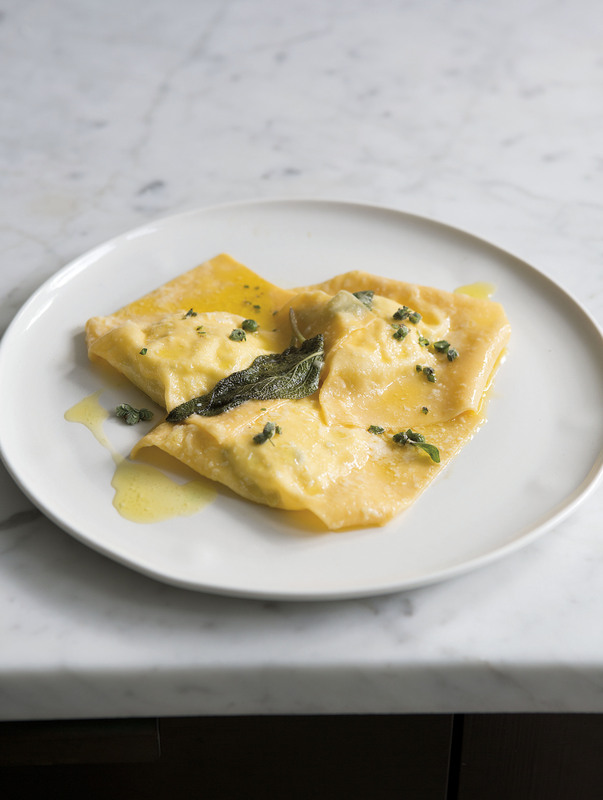 Arrange the ravioli on a clean tea towel, spaced apart slightly, to allow them to dry out a little before cooking. If you like, you can make them a few hours in advance and keep them on a flat tray that has been slightly dusted with semolina flour. To cook, bring a large pan of water to the boil, add salt, then the ravioli and cook for 3.5-4 minutes until al dente. Meanwhile, for the herb butter, melt the butter in a saucepan large enough to hold all the ravioli once it is cooked. Add the sage or marjoram and season with a little salt and pepper. Scoop the cooked ravioli from the water and add to the herb butter with 1tbsp of the water. Spoon the melted butter over the ravioli. Transfer to warm plates and serve at once.